Respiratory Hazards of Aluminum Welding - Sentry Air Systems, Inc.
With increasing pressure from federal fuel efficiency standards and consumer demand for vehicles with higher miles per gallon ratings, motor companies are looking for ways to “reinvent the wheel”. In response to this demand, Ford Motor Company recently unveiled their new 2015 aluminum-bodied F-150 pickup truck (pictured to the left). By replacing the existing steel body with aluminum, Ford was able to reduce the truck’s weight by 700 pounds; making it more fuel efficient without degrading strength or durability. Ford isn’t the only motor company utilizing the lighter weight material. In fact, General Motors is also racing to design an aluminum-bodied pickup truck by 2018. With two major car manufacturer’s embracing this metal, many auto body shops will be expected to perform maintenance and repair welding on aluminum. No matter the technique or metal, the process of welding will emit fumes. When welders inhale these fumes they run the risk of developing short ― and sometimes long-term ― health effects. Side effects and health hazards are dependent upon a variety of factors such as type of metal being welded, the amount of material, or length of exposure, among other factors. By implementing source-capture engineering safety controls, welders are able to protect their breathing zone and surrounding work area by arresting welding fumes at the source of emission. 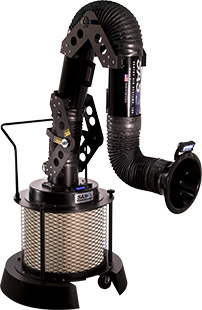 Sentry Air Systems has a complete line of welding fume extractors and filtration media designed to work efficiently and effectively in environments like auto body and repair shops. 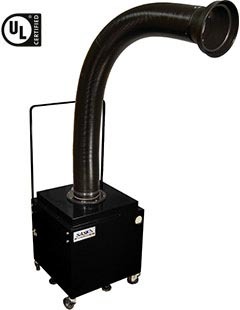 Our Model 400 and Model 450 Welding Fume Extractors are portable, powerful units and are excellent for low level usage, such as 2-3 hours of maintenance MIG/TIG welding per day. 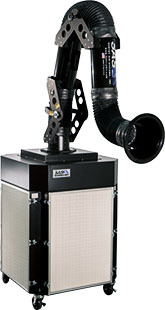 Typical filtration media includes a carbon pre-filter pad for large, odorous fume followed by a main HEPA filter for smaller particulate [up to 99.97% efficient on particles 0.3 microns and larger]. Both come with a 6″ diameter, 6′ long flame-retardant, semi-self supportive flex arm. For heavier applications where more than 5-6 hours per day are spent welding, we recommend one of our cleanable filter units. Our cleanable filters will save hundreds annually in filter replacement costs and are easily cleaned by applying pressurized air to the surface of the filter. Excess dust and waste falls into the removable internal dust pan for quick disposal. Multiple extraction arms available, also available in a dual arm configuration for multiple operator use. For more information about welding fume control or to receive a free quote on our fume extraction systems, give Sentry Air a call at 800.799.4609, email sales@sentryair.com, visit our website for fill out the feedback form below. 1 Government of Alberta. Work Safe Alberta. Welder’s Guide to the Hazards of Welding Gases and Fumes . 2009. Web. <http://humanservices.alberta.ca/documents/WHS-PUB_ch032.pdf>. 2 Unmack, James. State of California. Department of Industrial Relations. ALUMINUM WELDING FUME: Health-Based Assessment and Recommendation for HEAC. 2012. Web. <www.dir.ca.gov/dosh/doshreg/Al 3-26-12.doc>.